A long-standing highlight of Kenya’s safari circuit, 392 km2 Amboseli was set aside as a wildlife reserve in 1899 and made a national park in 1974. 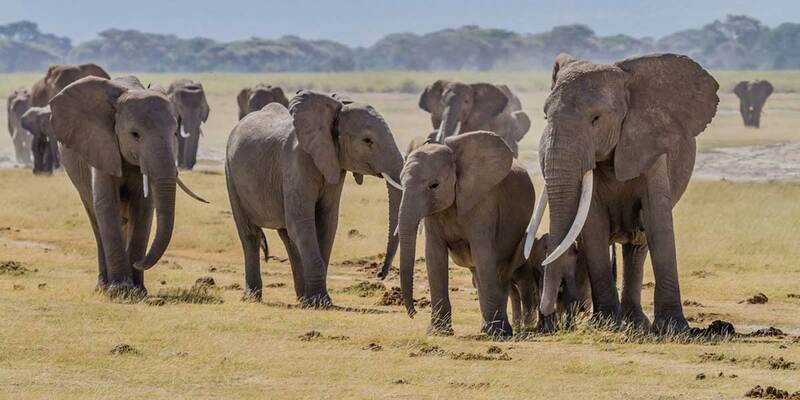 Renowned for its high density of elephants, the park forms the unfenced core of an 8,000 km2 ecosystem that includes large tracts of Maasai community land both in Kenya and across the border in Tanzania. Amboseli lies at the northern base of Kilimanjaro and, clouds permitting, it offers tremendous opportunity to photograph plains wildlife below the snow-capped peak of Africa’s tallest mountain. The 5,891 m summit of Kilimanjaro - the world’s tallest freestanding mountain, and Africa’s highest peak - actually stands within Tanzania, but the finest views of it are to be had from Amboseli. For much of the day, the volcanically-formed mountain is rendered invisible by a shroud of clouds, but this usually lifts at dusk and dawn to reveal the iconic snow-capped peak rising a full 5 km above the dusty plains in all its breathtaking glory. A dominating blue presence on maps of the park, the eponymous Lake Amboseli only holds water briefly in years of exceptional rainfall. The rest of the time, this flat dry dust bowl - formed by fine grey volcanic ash deposited by Kilimanjaro in its eruptive youth - supports large numbers of wildebeest, zebra and gazelle, and open-country birds such as the secretary-bird, Yellow-necked spurfowl and the localised Pangani longclaw. 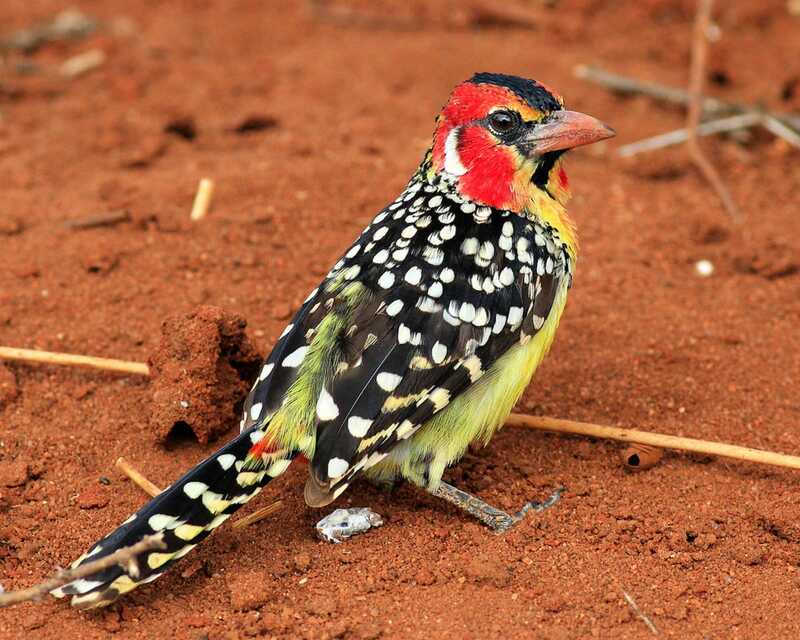 Scattered stands of umbrella thorn woodland, dominated by the distinctive flat-topped Acacia tortilis, are home to giraffe, impala and a host of striking dry-country birds, notably Von der Decken’s hornbill, red-and-yellow barbet, rosy-patched bush shrike and steel-blue whydah. 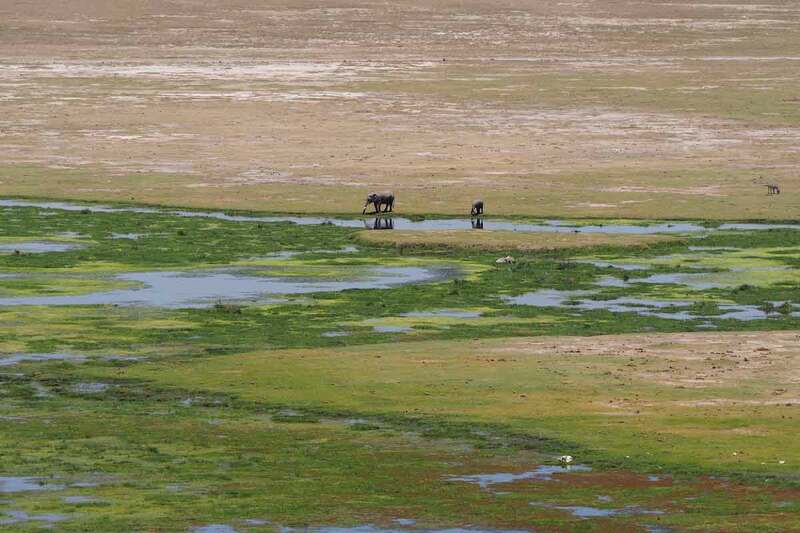 The permanent Enkongo Narok and Olokenya Swamps, fed by subterranean streams that rise on the upper slopes of Kilimanjaro, are home to plentiful hippo and a wide range of aquatic birds, among them long-toed lapwing, painted snipe, great white pelican and grey crowned-crane. Another must-see landmark is Observation Hill, which offers panoramic views across a pretty lake towards Tanzania, with Kilimanjaro often visible at dusk and dawn. Amboseli’s most famous and entertaining mammalian residents are the subjects of the Amboseli Elephant Research Project, which was founded in 1975 by Dr Cynthia Moss and retains exhaustive records of most births, deaths and relationships within an extended community of around 50 families whose range centres on the national park. As a result of this close monitoring, the elephants of Amboseli are unusually well-habituated and contain a high proportion of old tuskers - excellent sightings are all but guaranteed! The core national park is surrounded by a number of private conservancies that comprise Maasai community land and offer exclusive traversing rights to one or two small camps or lodges. The conservancies support several species seldom observed within the national park, for instance gerenuk and lesser kudu, and the ability to head off-road allows guests to make the most of cheetah and lion sightings. Coming by road, Amboseli is 230 km from Nairobi via Namanga, a drive that includes some heavily corrugated sections and takes about five hours in either direction. Road safaris often combine Amboseli with Tsavo West National Park, which lies about 120 km away along a poor dirt road. It is also possible to fly in to Amboseli from the likes of Nairobi, Mombasa and the Masai Mara. Several lodges lie within the national park, and the surrounding conservancies are serviced by some excellent upmarket tented camps.